When I revealed that the new edition of Cortez on Jupiter would have a conquistador image on the cover, there was some objection. 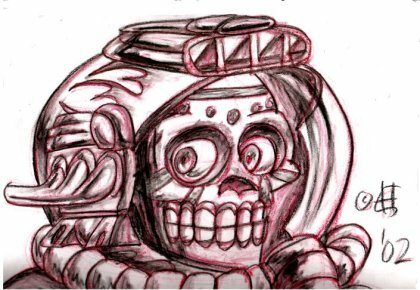 The image of the guy with the beard and the pointy helmet triggers gut reactions, based on bad feelings over their spawning our hijo de la chinga heritage. In his later years, my dad told me he couldn't read the history of our people – it just made him mad. I understand. It makes me mad, too. The bad rap the conquistadors get is largely deserved, but Aztlán, and most of las Américas, are a world they helped make. Seven Myths of the Spainish Conquest by Mathew Restall is a good place to start learning about them, to get a little closer to the truth through all the centuries of mythotech wars. Besides, I find it a little hard to take that English and French explorers are seen as bringers of civilization who marry Pocahantasoid Indian princesses, while the conquistadors are scumbag murderers and rapists. Meanwhile, the natives of New England are rare, and those of the Virrenato de Nueva España are alive and well and ready to change the course of history. Restall questions what we assume about the Conquest – even why it is called the Conquest. He challenges the Anglo-biased history/myth I was taught in school by teachers who could talk about Mexicans while denying that some of us were there in the classroom. They found the Spaniard preferable to the Aztecs, but basically glossed over things until white people showed up. He goes after the myth of a civilization being brought down by a handfull of exceptional adventurers. 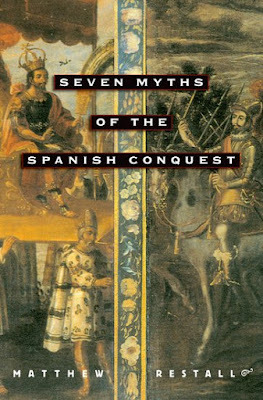 Turns out the conquistadors were aided by African slave/soldiers (the Spanish brought a lot of Africans to the New World – there were also black conquistadors -- and their heritage keeps popping up), and worked largely independently from the Spanish crown, communications being what they were in those low-tech days. Joining them was one of the few way of moving up in their world – in a strange way, they were persuing their version of the American Dream. Was the Conquest truly completed, or was this another case of premature Mission Accomplished? Ask the Yaqui, or certain Mayan tribes. And there are places were natives still speak their own languages. La Malinche's translations may not have been as perfect as a Star Trek universal translator. There were miscommunications. They are still going on. And of course there's the big myth of racial and cultural superiority. It is pointed out that the conquistadors were aided by three powerful allies: small pox (biological warfare sometime just happens), steel (that old devil technology), and native disunity (other tribes weren't crazy about Aztec rule and helped take down Tenochtitlán). It is a short book with a lot of picanate food for thought. It also make me want to read more of our history. Like my dad, it will probably make me mad, but I need to do it. I need to crash through the mythoteching and get a little closer to the truth, whatever it may be. Ernest Hogan is the author of Cortez on Jupiter, High Aztech, Smoking Mirror Blues and other acts of literary mythoteching. Great post. History is complicated. For example, Doña Marina, La Malinche, is often cited as an Aztec when she was from a different nation and aided the Spaniards to get back at the Aztecs for what they had done to her people. Also, the territories of northern Mexico were never conquered by the Spaniards. They negotiated treaties and accepted Spanish rule in exchange for control of trade. Unfortunately, when you look up Mexico colonial history you pretty much get only Aztec history. I was one of the "objecters" of your conquistador cover. Still am. I just got back from New Mexico, and towns full of hippie-looking Indians and Indian-looking hippies. Hispano reporters cover crimes and political scandals by Hispanos. All over Aztlán, we have places named for conquistadors who aren't remembered, like our cities with names in native languages we don't know, and mispronounce. More investigations are necessary.